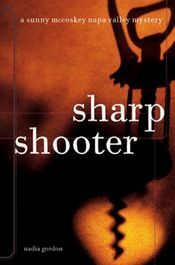 MystereBooks is pleased to feature Sharpshooter by Nadia Gordon, now available at a special price, courtesy of the publisher, Chronicle Books. The ebook format of this title was priced at $1.99 from the listed vendors (below) as of the date and time of this post (02/28/2014 at 3:00 PM ET). Prices are subject to change without notice. The price displayed on the vendor website at the time of purchase will be the price paid for the book. Please confirm the price of the book before completing your transaction.